Fueled by texting, talking on the phone, and even posting to social media with mobile devices, distracted driving is on the rise. Distracted drivers are involved in more than a quarter of fatal and serious injury crashes in Minnesota. In 2015 alone, 3,477 people were killed in car wrecks involving distracted drivers, while 391,000 were injured nationally, according to the Centers for Disease Control. If you’ve been injured by a driver you believe was distracted, it’s critical that you hire a personal injury attorney experienced in handling such claims. 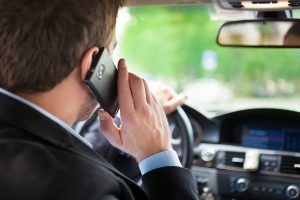 Drivers who were using their cell phones or otherwise engaged in distracting actions before a crash may not readily admit to their behavior during investigations by police officers. It’s important to hire a lawyer familiar with proving such conduct. Everyone knows that drinking and driving is dangerous; however, studies suggest that cell phone use may be almost as bad, or even worse. In one study using a driving simulator, researchers found people with blood alcohol concentrations of up to 0.08 percent (the legal limit in all 50 states) operated less impaired than those talking on cell phones. Alcohol affects drivers by reducing their visual function, delaying their braking responses and increasing the chances that they will leave their lane. For people who are sending texts while driving or using social media apps like Facebook, Twitter, and Instagram while behind the wheel, nothing is focused on driving: Not their eyes, not their hands, and, most certainly, not their minds. In car accidents resulting in death, alcohol and drugs are considered “aggravating factors.” Cell phone use is not currently an “aggravating factor” in criminal vehicular homicide. So, prosecutors must prove a driver who was distracted by texting acted with “gross negligence.” “Gross negligence” is very hard to prove. Even when a texting driver kills someone, he or she may be found guilty not of a felony count of criminal vehicular homicide, but of careless driving, a misdemeanor, and spend fewer than 30 days in jail, if any jail time is even imposed. If you wouldn’t drink and drive, ask yourself, “Why would I risk my own safety or that of my passengers and others on the road just to text or post a status update?” Pull over if you must read or respond to a text immediately. If you can’t resist picking up your phone whenever it chimes, use Do Not Disturb options. The iPhone’s iOS 11 and iOS 12 have a Do Not Disturb While Driving function. If you turn it on, your phone senses when you are driving, keeping your screen dark. Those messaging you can receive an automatic reply that you’re driving. Similar apps are available for Android phones as well. If you’ve been injured in a crash by a negligent driver who was distracted, call our office today. Our law firm has recovered more than $125 million on behalf of victims and we are ready to assist you.